I cannot open and print the application form using my Internet browser.Please, check if you have program a called Adobe® Acrobat Reader (version 4.0 or higher) installed on your computer. If not, download it for free from Adobe web-site at acrobat, install it and try to open the application form link again. That should solve the problem.If, having installed Adobe Acrobat Reader, you are still unable to open application link, please right-click it once, choose SAVE TARGET AS… option from drop-down menu, save it on your hard disk and open it from there with Adobe Acrobat Reader. What is that Tourist Voucher thing?Tourist Voucher is the document, where the tourist services, which are to be provided to you (i.e. airport transfer, hotel accommodation, museum excursions etc. ), are listed How much money in foreign currency can I bring to Russia?You can legally bring to Russia any amount of cash money; however you are required to declare a sum that is more than $3,000. You can legally bring out of Russia only $3,000 in cash. If you have more, the rest of the sum must be accompanied by a special certificate from a Russian bank called “Raz-resh-enih-ye nah vyh-voz vah-lyu-ty” (Permission to export currency). Are there Currency Exchange offices in Russia?Yes, there are. You can legally exchange foreign currency in Russian banks. Are there any restrictions on the travel checks (Thomas Cook, American Express, Visa etc.) or credit cards in Russia?No, there are no restrictions. Credit cards and travel checks are not to be declared and can be used freely. Russian banks can cash your travel checks. 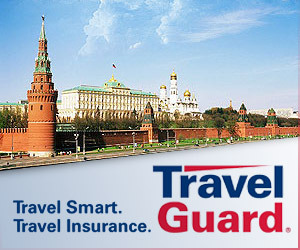 You can also buy travel checks in Russian banks. You can find ATM Machines in the hotels, airports and banks. I take pills. Is it OK to bring medicine to Russia?Yes, in reasonable quantities for personal consumption. I have non-consumer radio equipment (i.e. walkie-talkie, GPS, radio transmitter). Is it legal to bring it to Russia?To avoid any inconveniences, you are strongly advised to declare that equipment at the Customs Control and consult a Customs officer. If it is forbidden in Russia, it will be put in Customs storage and returned to you when you leave Russia. I want to bring my dog or cat with me. What are the veterinary requirements?Prior to arrival to Russia, all dogs and cats must be put in quarantine for 21 days in the US. During last 14 days (but not earlier) they must get vaccination (please, consult your veterinarian) and animal’s transportation container must get special sanitary treatment. Upon completing these procedures, the veterinarian issues a certificate, which you have to get authorized at your local Office of the Department of Agriculture (or similar local official authority) and, then, translate into Russian. Please, note that in some cases Russian quarantine authorities may require the pet to be put in quarantine in Russia for additional 30 days. I have an invitation to visit a City of (city name) in Russia. Having received my visa, will I be able to visit other cities in Russia?Yes. Some time ago we adopted a child in Russia and now we want to go there together. Do we have to get Russian visa for our child?No, you do not. Children, adopted in Russia, remain Russian citizens until they are 18 years of age (when they can choose their citizenship themselves) and are issued a Russian passport upon adoption. Russian Law does not forbid them to be US citizens at the same time, however, requires them to travel to Russia on their Russian passports. I need a double-entry Visa. What documents do I have to submit?Same documents as for a single-entry one, however, the necessity to get a double-entry Visa must be reflected in your invitation. How do I get a multiple Visa?Your partners in Russia must apply on your behalf to the Ministry of Foreign Affairs or to its Regional Offices in Russia to get the invitation for a multiple Visa issued. Then, this invitation will be cabled to the Consulate or sent to you directly. Once the Consulate receives it, you become eligible for a multiple Visa. I lost my Visa to Russia. Can I be issued a duplicate?Yes, we will issue you a duplicate, however you will have to pay the minimum processing fee ($70 – for single-entry; $120 – for double-entry; $200 – for multiple) again and it will take up to 3 business days. How do I invite my friends or relatives FROM Russia to the United States?We cannot help you with that. You have to contact your district Office of US Immigration and Naturalization Service or US Embassy and Consular Missions in Russia (more information at this link moscow.usembassy.gov. I came here from the former USSR or Russia and received US citizenship. Why do I have to confirm the absence of Russian citizenship in order to get Russian Visa?If you are a citizen of Russia and receive US citizenship, it does not mean that you automatically lose your Russian citizenship, because, according to the Law, no person can be deprived of his/her citizenship, but on his/her stated (i.e. put officially in order) will. Russian Law does not forbid you to have several citizenships, however, considers you only a Russian citizen and, therefore, requires you to travel in and out of Russia on your Russian passports.Being a State institution, Consulate General enforces the Law of the State, so, every person, whose foreign passports or travel documents indicate his/her place of birth as “Russia” or “USSR”, or one of the states, which constituted former USSR, will be required to present proof of absence of Russian Citizenship. Although, my passport says that I was born in Russia or USSR, I know for sure that I am not a Russian citizen but all my paperwork, which might confirm this fact, got lost a long time ago. What do I do?You can send a special request for confirmation of the absence of Russian citizenship to the Russian authorities through the Consulate. It takes time (1-6 month), so, please apply in advance. Upon receiving the answer, the Consulate will issue you an official document confirming that you are no longer a Russian citizen. What are the visa requirements for the citizens of the former USSR?No visa required for the citizens of Azerbaijan, Armenia, Byelorussia, Kazakhstan, Kirgizia, Moldavia, Tajikistan, Ukraine, and Uzbekistan. Visa required for the citizens of Estonia, Georgia, Latvia, Lithuania, and Turkmenistan. When in Russia, can I change my visa status (i.e. from tourist to business or from business to educational and vice versa)?No, you cannot change your visa status being in Russia. In order to do that, you have to leave the country and reenter on different visa. I am in Russia. What to do in emergency?In emergency, please contact the nearest Consular Office or the Embassy of your country or Russian authorities. In Russia, you can contact Fire Department by dialing 01, Police Department – by dialing 02, Paramedics – by dialing 03.